A political convention provides the backdrop for The Best Man, a 1964 adaptation of Gore Vidal's stage play about the maneuverings of a pair of would-be presidential nominees. Henry Fonda plays William Russell, the current Secretary of State and a self-confessed egghead who spouts quotes, jokes with reporters, and avoids rumors about his philandering. Cliff Robertson portrays his opponent, Senator Joe Cantwell, a fiery politican who rose from humble beginnings and gained fame trying to connect the mob to communists. With Russell holding a slim (but undecisive) lead among the delegates, each man seeks the endorsement of the party's popular former president, Art Hockstader (Lee Tracy). In a candid conversation with Russell, Hockstader reveals that he's dying from cancer. It's clear that these men value their friendship and respect each other, but Hockstader also harbors concerns about Russell's indecisiveness. He confides to his friend: "Sometimes, you get so busy thinking how complex everything is that the important problems don't get solved." After the meeting, when Russell's wife and his campaign manager ask if he got the endoresement, Russell replies: "It's what he (Hockstader) didn't say. He's going to support Joe Cantwell." That evening, during the pre-convention dinner, Hockstader surprises everyone when he endorses no one. Without a clear favorite, the party's nomination is truly up for grabs--and that's when the political chess moves really begin. The former president endorses no one. A heavy dose of cynicism permeates The Best Man, most notably in the unexpected ending. Vidal, who adapted his play, takes potshots at everything from the candidates' posters ("Hustle with Russell") to their carefully orchestrated political ploys. In one scene, as Russell and his staff view a "spontanteous demonstration" on the convention floor, a staffer comments that it's supposed to last for twenty-two minutes. One suspects that Hockstader best represents Vidal's own views, with dialogue such as (spoken to Cantwell): "It's par for the course when you fool people." Still, The Best Man is a film with neither heroes nor villains. Cantwell may be ruthless, dangerously ambitious, and willing to distort the truth. However, he is also a faithful, affectionate husband who is innocent of key accusations made against him. Furthermore, as Hockstader notes, he "knows his own mind"--which might make him a better president than Russell. As for Russell, he is certainly more likable, but has cheated on his wife, may lack decisiveness, and finds himself a hostage of his own ego ("I never pass a mirror I don't look in...I wonder why?"). Fine performances abound in the The Best Man, with Robertson and Fonda at the top of their games. Lee Tracy steals many scenes, but then Vidal gives Hockstader most of the juicy dialogue. 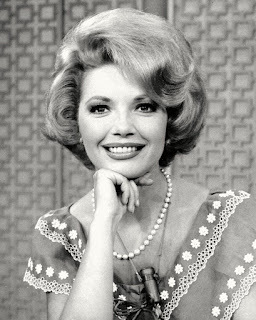 Tracy originated the role in the 1961 stage version of The Best Man and won a Tony. He received an Oscar nomination for Best Supporting Actor for the film version (losing out to Peter Ustinov in Topkapi). 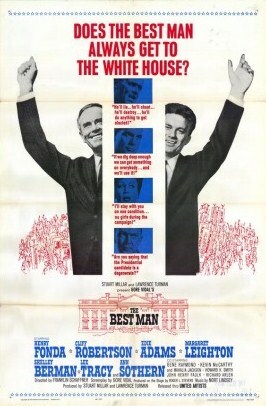 An intelligent examination of American politics, The Best Man shares many similarities with the earlier Advise and Consent (e.g., Fonda is a nominee for Secretary of State in the latter film, Robertson and Don Murray cope with similar allegations). It may lack the intensity of Advise & Consent, but it's a rewarding, still relevant film. It also foreshadowed two of the darker periods in American politics: In 1972, Senator Thomas Eagleton, George McGovern's running mate, resigned as the vice presidential nominee when it was revealed he had been treated for depression; The Best Man was filmed at the Ambassador Hotel in Los Angeles, the place where Robert Kennedy would be assassinated in 1968. I think "The Best Man" is a thought provoking film. The former president has a key role and it is fascinating to watch him interact with both Russell and Cantwell. Russell is truly concerned for Hockstader's health but Cantwell ignores him when told he is dying. Then Cantwell pushes forth his agenda and you really just know you don't care for him. The performances are spot on. The timeliness of this review is well done, too. Excellent post, Rick! When I watched this years ago I thought how much politics hasn't changed. Fonda's character almost remind me of Newt Gingrich in this year's mudslinging-go-round. It's all just so ruthless, and The Best Man very much displays this. This is a fine film. I watched it again last year and was still impressed. It's one of those films you find yourself watching intensely, making sure you don't miss anything. Shelly Berman really and truly gives me the creeps in his scenes. What an odious little piece of you-know-what. One of the greatest films, period, and far darker and more intense than "Advise and Consent," I think. This was the one pure Gore Vidal movie (not based on anyone else's work, like "Suddenly Last Summer" from Tennessee Williams' play) that the studio didn't turn upside down or inside out. Capra was originally going to direct but was fired after insisting that Fonda's character show up on the convention floor dressed as Lincoln(! ), and Vidal wound up able to leave in the atheism along with all the other realistic touches from the play. Vidal, raised by his grandfather, a US senator, and almost too savvy about US politics, was also advised by President Kennedy on at least one dialogue exchange. Of course Fonda's character was based on Adlai Stevenson while Robertson's was Nixon incarnate. 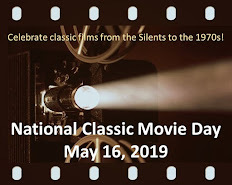 This is certainly the most intelligently scripted film about US politics and the most entertaining, and remains prescient, with the Broadway play version revived for a recent election. You mentioned Fonda's character's infidelity and Robertson's fidelity to his wife, putting one in mind of our last couple of presidents before Obama. Clinton brought the kind of intelligence offered by Fonda's character but wasn't a physically faithful husband while presumably faithful Bush destroyed everything. Vidal briefly plays a senator in one scene in the film, by the way, although that's missing from most televised versions. Lee Tracy was a big albeit obnoxious star in the early 1930s until he drunkenly urinated from a balcony onto a crowd of Mexicans in Mexico City during a party after location shooting for the Wallace Beery movie "Viva Villa," sinking his career for decades. His performance as the Harry Truman character in this movie was masterful. By the way, Fonda's character reminding a previous poster of Newt Gingrich astonished me to my marrow when I just looked up and saw it!